Rats are constant and entirely unwelcome guests everywhere where there is human flesh on which to feast. British soldiers fight as continuous a battle with them as they do with the Germans, and it is splendid that there should now be an Officer Commanding Rats! “It was at the Field Ambulance that I met O.C. Rats. I had come in that afternoon, not wounded this time but with a silly leg and foot which I hardly possessed it seemed, a result of sciatica. The medical officer for the day was looking round for the night and brought a companion with him whom he introduced at O.C. Rats. I had been keenly interested in this appointment ever since we received the order in the front Line to look out for any Rats that appeared to have died from natural causes and to send any such, duly labelled, to Brigade Headquarters for examination by a Bacteriologist. ‘B,’ in the next bed, said he had fired 72 rounds with his revolver at the beasts, and generally had a shoot at night, but had never seen a naturally deceased rat. I related my experiences with a cane and how I had once made the mistake of moving my foot too soon when I trod on one in mistake on the duckboards. O.C. Rats said we must let some of them die naturally, otherwise how could he judge the effect of the serum which had been given to the rats by a thoughtful Government with views to exterminating them entirely. I explained to him that when a Platoon Sergeant lost his upper denture completely, rats having taken it off from the shelf in his dug-out whilst he slept, and the Company Sergeant-Major had all the vulcanite bitten off his lower denture when having a siesta, one could hardly expect a truce between the men and the rats, so that the serum could work out to a scientific conclusion. Ragging the OC Rats is entirely in character with a young Douglas in his schooldays! In addition to the 8 killed, we will be listing in the next edition of our magazine, the names of 26 Old Dragons who have been wounded in action. Working my way along the line, I point out various things to be cleared up and attended to. I come to the first place I want another look at… seems about the best bit of ground just forward. The trees and undergrowth are thick enough to screen me from the German lines, about 120 yds. in front, and it will be quite all right if I do not go right to the edge. Anyhow, I must get a more definite idea as to what sort of field of fire and cover there is. I go forward a few paces, then a few more; some bullets about, stray ones I suppose – anyhow nothing unusual… I crouch down with eyes close to ground to get the lie, then have another look, bending fairly low. Calls to the breastwork bring four or five to my assistance. I warn them off, don’t want any more casualties, rotten as it is. Second Captain comes up. He is in command now. Stretcher bearers creep up and give me some very warm water to drink; I feel all right, rather excited and getting stiff and numb in the lower parts of the body. Corporal says he must cut my breeches, but will try to keep to seam. I ask if bullet is out. No, he says, it is not. Iodine makes things smart. They begin to open stretcher. No, I cannot get on the thing and you cannot carry me without exposing yourselves. All right, I think I can crawl on my elbows, anyhow let’s try. Yes! I can get to the breastwork; you crawl behind and push my legs along. I am a trifle tired when I get to safety. From there Douglas was conveyed to safety. Lieut. CWH Bailie (2nd Bat) – from 2nd Lieut; 2nd Lieut. 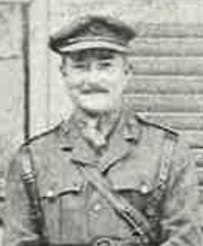 MC Cooper (4th Reserve) – from Private; 2nd Lieut. JCB Gamlen (3rd/4th Bat); Lieut. CSW Marcon (4th Bat) – from 2nd Lieut; Capt. GK Rose (1st/4th Bat) – from Lieut; 2nd Lieut. 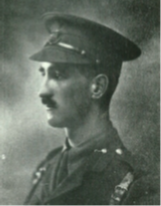 HEF Smyth (4th Bat) – from RMC Sandhurst; 2nd Lieut. RF Symonds (Bucks Bat); 2nd Lieut. WJL Wallace (3rd/4th Bat).